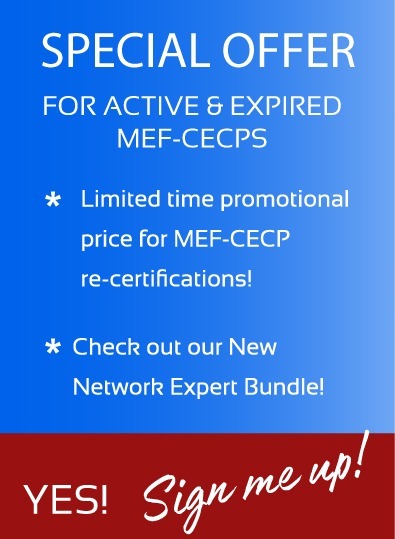 The MEF's Professional Certification program is highly valued, identfying the industry's top Carrier Ethernet professionals, showcasing their expertise and excellence in technological knowledge and understanding of Carrier Ethernet service specifications and definitions. Click here to find out more. MEF Network Foundations (MEF-NF) certification validates the skills necessary for network transformation. A concept-level introduction into SDN, NFV, Carrier Ethernet, and Network Orchestration/LSO. Click here to register today! MEF SDN/NFV Certified Professional skills certification is the first ISO-standard that validates knowledge, skills, and abilities in the domains of SDN and NFV. MEF-SDN/NFV exam is launched. The blueprint guideline is available for study. Click here for more details and register today!